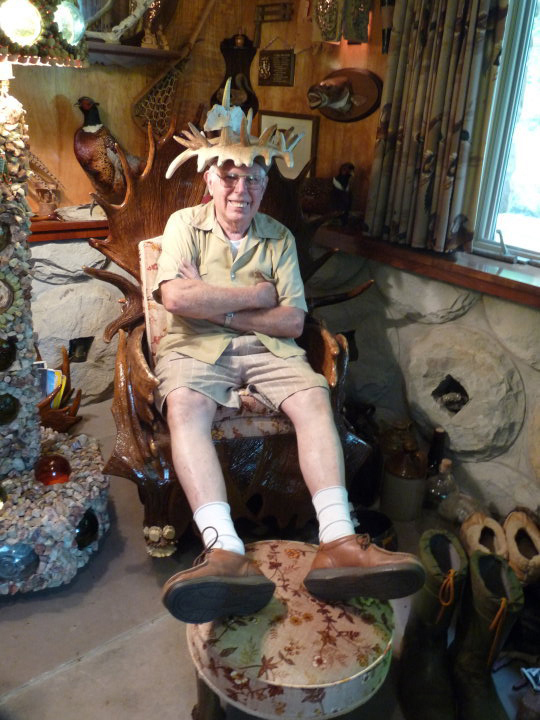 Bill Steckman’s forty-something year passion for all things antler began innocently enough on a vacation to Newfoundland, Canada in 1969. Enquiring of a local where he might find a set of moose antlers, Bill was invited to stop by for a visit. Immediately impressed by “what a moose could build without any formal education” Bill offered to trade a bottle of rum for the rack. Returning many, many times over the years, Bill collected “not hundreds, but thousands of antlers” from over 180 families across Newfoundland, each of whom still receive an annual Christmas card from the Steckmans. On the homeward journey to Salamanca, New York, Bill’s motorhome was usually burdened with thirty or forty antler sets or more, prizes won in trade for bottles of rum and scores of Swedish knives! What a sight it must have made rolling down the highway bristling with bone! And what has Bill done with his mountain of moose antler? 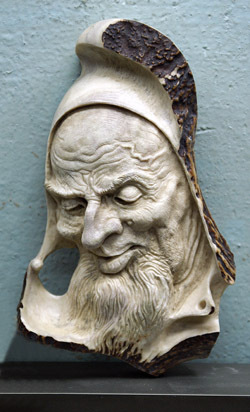 Carved some, commissioned work from others, sold raw at the local Seneca Nation Pow Wow, built furniture blessed by the Pope and filled a custom built ‘cabin’ to the brim, that’s what, and he’s learned a pack in the process that he is willing to share with fellow antler enthusiasts. 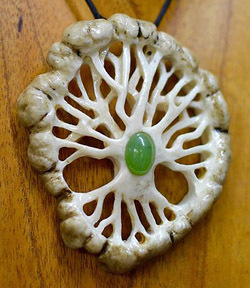 He is currently at a point in his life where deteriorating health has made it difficult to do the things he has in the past (“I have trouble using a screwdriver”) and he feels it is time to divest himself of many of his creations and commissions. 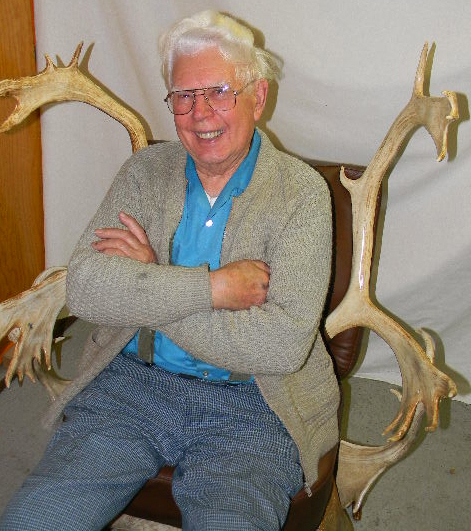 I don’t think it would be an exaggeration to state that Bill Steckman is perhaps one of the first collectors ever of all things antler, and I can’t help wondering if it wouldn’t behoove a contemporary collector to consider acquiring much of Bill’s offering to keep this precious legacy intact. After serving in the U.S. Navy during WWII, Bill found permanent employment with the Erie Railroad, retiring after 43 years. 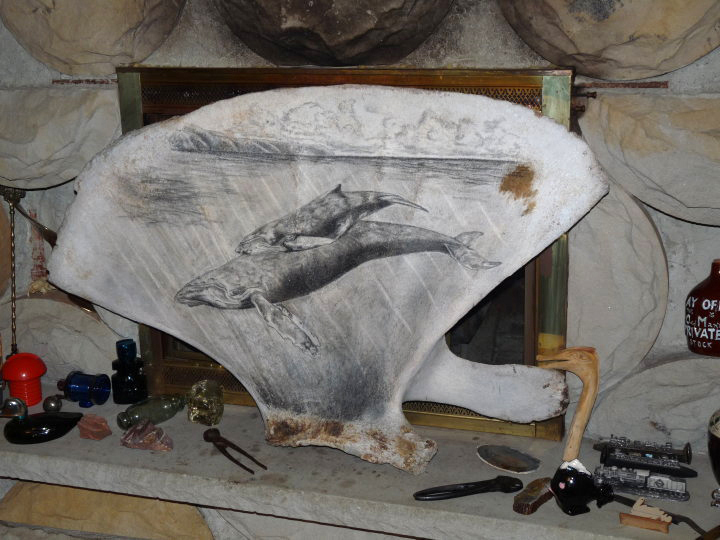 One glance inside the ‘cabin’ he built from reclaimed railway buildings reveals that his passionate interest in antler, begun during his employ, has blossomed in retirement. When Bill began in antler, hardly anyone was working in the medium. 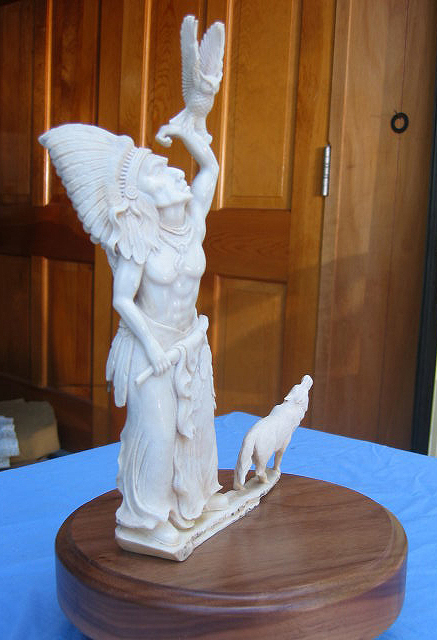 A native carver taught him how to carve using a hammer and chisel, but, not surprisingly, he found this difficult. 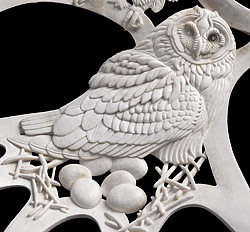 Later he bought a Dremel and foot pedal (prior to the Flexible Shaft attachment) but gave it up when he encountered an artist who exhibited real skill in creating a level of detail he could not match. 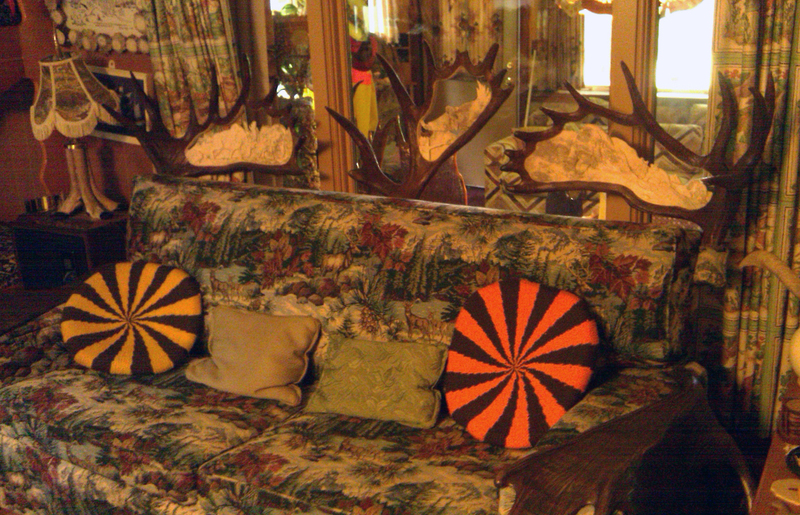 Bill has focused his own efforts on the creation of antler furniture. 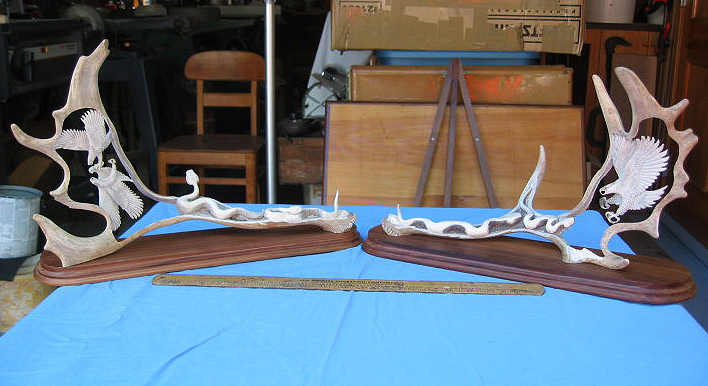 Chairs and footstools, dining and coffee tables, Davenports, lamps, and chandeliers – he’s made them all and learned much about working with antler in the process. He works closely with an Amish upholsterer, who covers his creations in tapestry and leather, and, lately, has found an assistant, fellow rail road employee Bill Skoken, who helps with some of the tasks he can no longer perform. 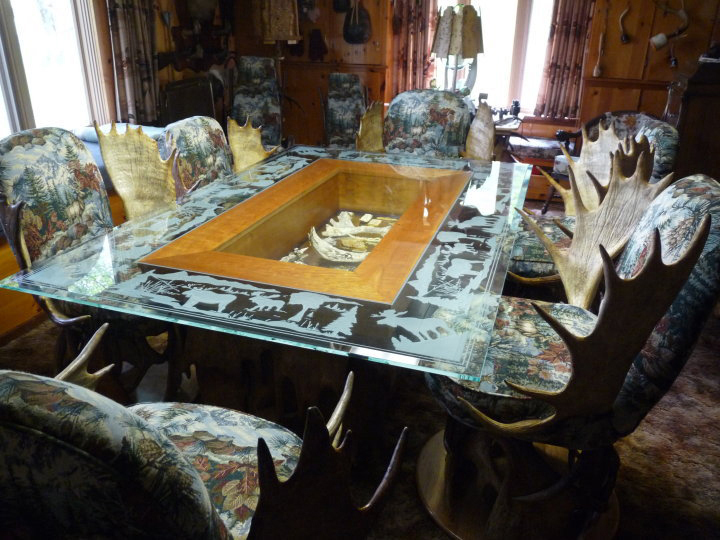 Density– Moose antler comes in different densities, “some are lighter than others of similar size, it all depends on what the moose was eating.” He selects the heavy, perfectly formed antlers for use in his furniture. 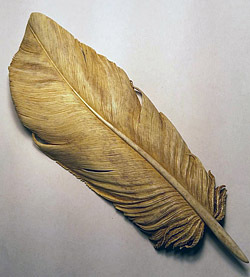 Dust – When working with antlers – dust is a factor. Bill uses a Grizzly Dust Collection Systemwith 4” pipe and two big bags, into which all of his power saws are plumbed (table saw, planer, jig saw, band saw). 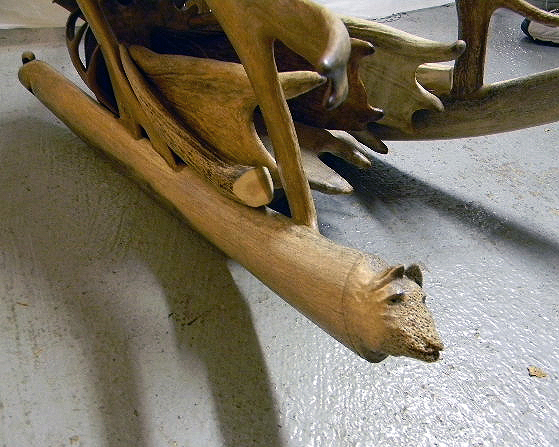 Mounting – When mounting antlers to walnut base, use glue and/or a dowel. 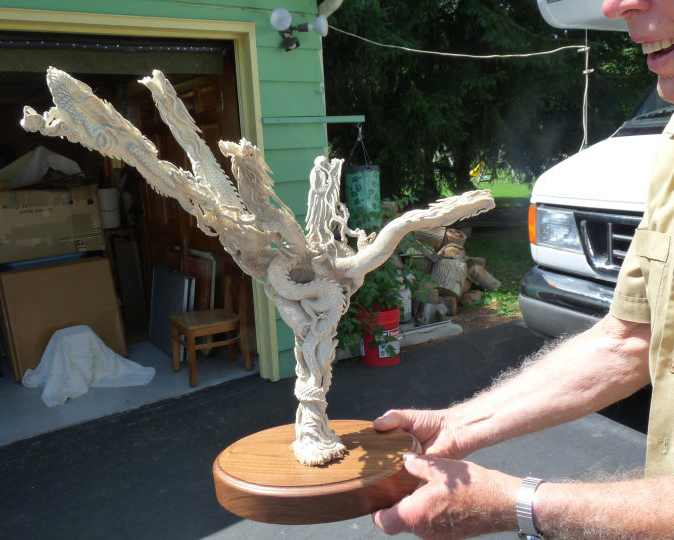 Finsh – As a finishing coat on some of his items he uses up to six coats of Tung Oil. Bill will soon be 86 years old. 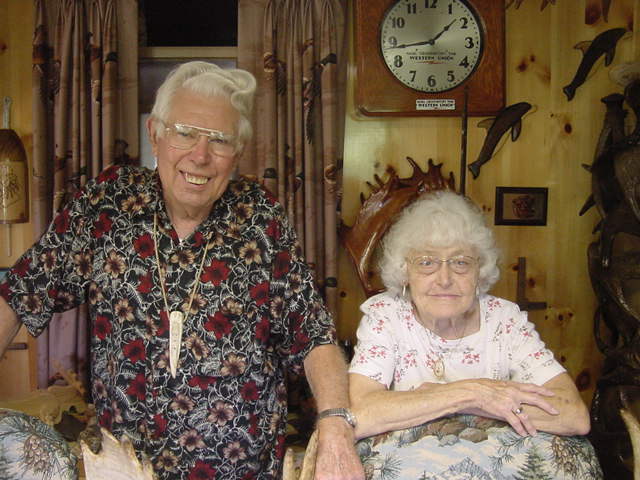 He suffers from dizzy spells and macular degeneration, requiring monthly treatments. 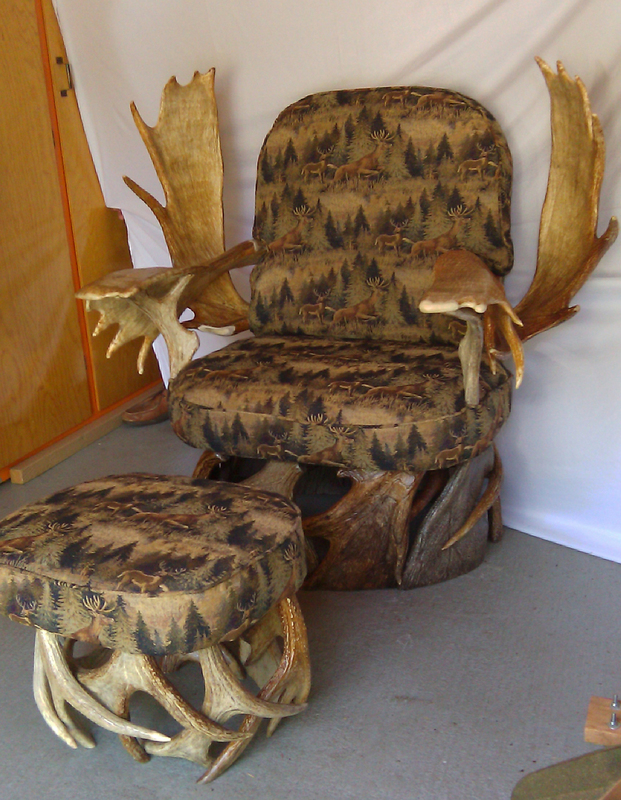 This winter, with help, he figures he will make his last chair with the few special antlers remaining in his inventory. 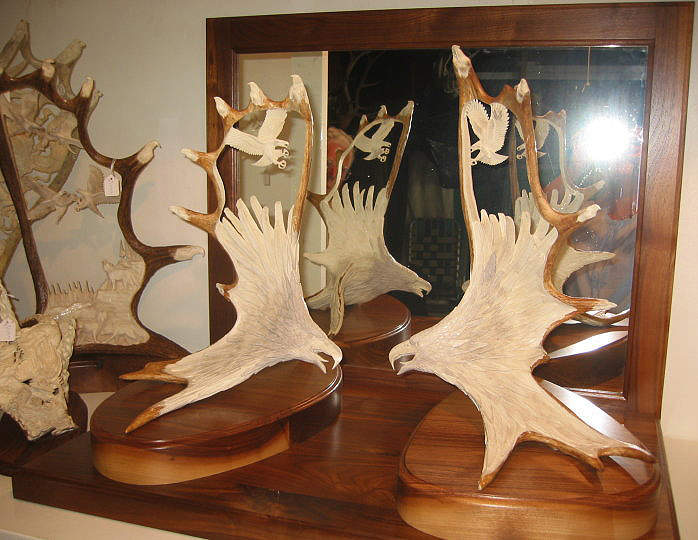 Bill and his wife Anna have no children to whom they can bequeath this marvelous collection of antler furniture and carvings, so Bill is offering it up for sale. Neighbour, friend and artist, Cassie McLaughlin Woolen, is helping Bill get the word out, and is responsible for most of the photos in this article. She has posted many more images on her Facebook profile and will act as a liaison with Bill, who does not have a computer. Jack Brown also provided some of the photos. If you are interested in any of the pieces please contact Cassie through Facebook or by phone at (716) 307-5220, or call Bill directly at (716) 945-1592. 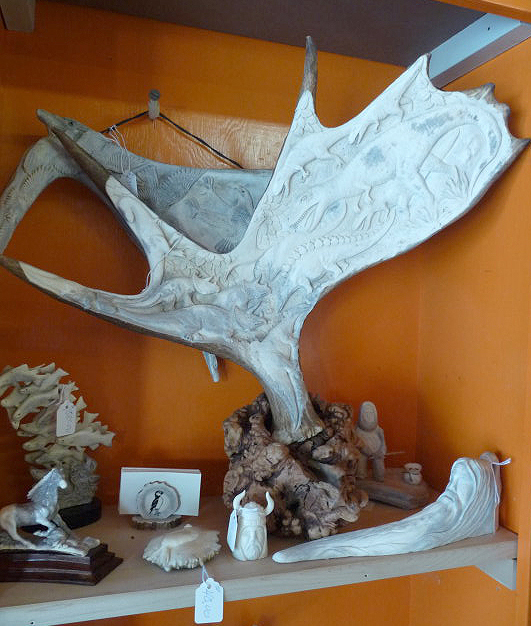 How wonderful it would be to preserve Bill’s legacy and build upon it to create a truly great collection of antler sculpture and craft! 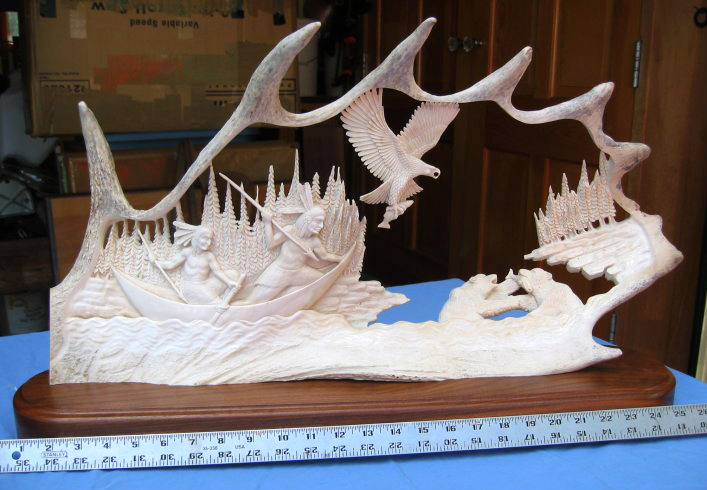 This blog is about the art of antler carving. 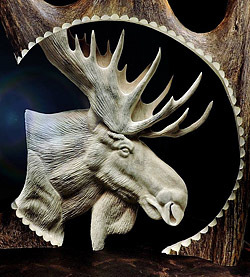 It is for and about antler carvers. 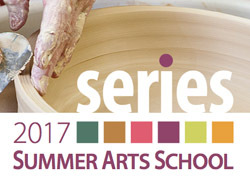 Images, tools, tips, techniques, marketing - we'll cover it all. 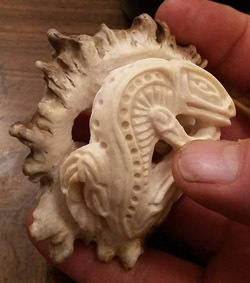 The blog may also be of interest to carvers of other materials (such as horn, ivory or bone) since we share many of the same tools and techniques. And the differences are sure to be instructive!